Photo published in Newsweek of a Palestinian family after Israeli air strikes in Gaza. Growing awareness of such incidents has eroded Democrats’ support for Israel. A new pro-Israel group is hoping to counter this trend. From Democratic Majority for Israel (DMFI) website. This is a sharp departure from Sinema’s past, when she was known for her anti-war activism, support for Palestinian human rights, and Green Party membership. Kryten Sinema at 2003 antiwar rally. Home page for the Democratic Majority For Israel, February 2, 2019. New York Jewish Week reports it’s “an open secret that the group was conceived and initiated by AIPAC,” the American Israel Public Affairs Committee. According to The Forward, 11 of its 15 board members have either worked or volunteered for AIPAC, donated to it, or spoken at its events. McCollum has been in the sights of Israel partisans ever since she introduced a bill during the last session of Congress to prevent U.S. aid from subsidizing the abuse of Palestinian children. “An estimated 10,000 Palestinian children have been detained by Israeli security forces and prosecuted in the Israeli military court system since 2000. Independent monitors such as Human Rights Watch have documented that these children are subject to abuse and, in some cases, torture — specifically citing the use of chokeholds, beatings, and coercive interrogation on children between the ages of 11 and 15. In addition, the United Nations Children’s Fund (UNICEF) has found that Palestinian children are frequently held for extended periods without access to either their parents or attorneys. For information on Israeli violence against Palestinian minors see the reports by B’Tselem and Defense for Children International – Palestine. For a list of children killed by Israeli forces see this timeline. Mellman has also worked for top level politicians in Israel, South Africa, Colombia and Albania. He was a consultant to CBS News for over 20 years, and was a presidential debate analyst for PBS and the Wall Street Journal. DMFI’s other co-chair,Todd Richman, is a JP Morgan managing director and former AIPAC staffer. “Todd Richman is a top Democratic fundraiser raising money for several Members of the House leadership and several US Senators including; Sherrod Brown, Amy Klobuchar, Joe Manchin, and Jeanne Shaheen. “Richman served as a Democratic political consultant and worked for numerous elected officials, including: Congressman Gary Ackerman (D-NY), Congressman Steve Rothman (D-NJ), NY State Attorney General Robert Abrams (D-NY) and Congressman Stephen Solarz (D-NY). Jennifer Granholm speaks at 2018 AIPAC national convention. See video here. Other board members are wealthy, well-connected Israel partisans from around the U.S. Many have lobbying and media connections. Below are their official bios. Australian film ‘Stone Cold Justice’ on Israel’s torture of Palestinian children from Voice of East on Vimeo. 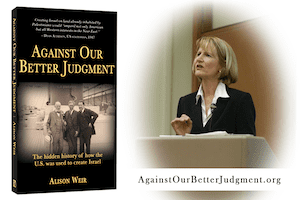 Alison Weir is executive director of If Americans Knew, president of the Council for the National Interest, and author of “Against Our Better Judgment: The Hidden History of How the U.S. Was Used to Create Israel.” Her articles have been published by The Link, Project Censored, Dissident Voice, Antiwar.com, MintPress News, CounterPunch, Z Magazine, the Washington Report on Middle East Affairs, and others.